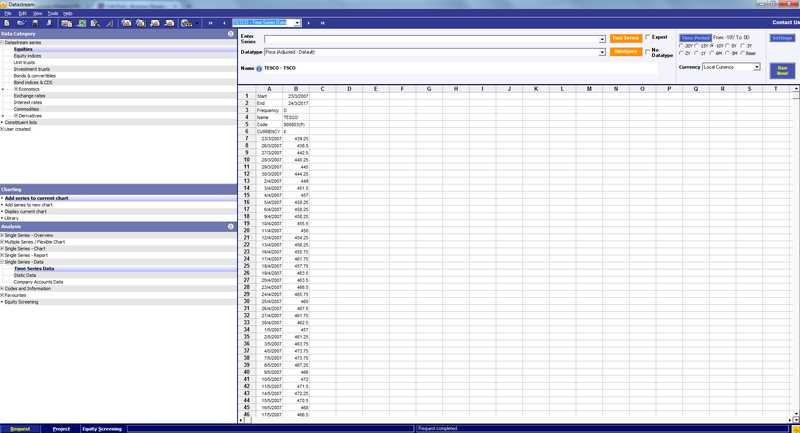 Datastream is useful to be able to search for multiple companies (Series) and datatypes, in terms of quantitative data. For example, Tesco PLC, J Sainsbury PLC and Marks & Spencer Group PLC are UK supermaket groups, each within the FTSE100 Price Index. One measure of company performance is Share Price. This quantitative data can be represented in chart form. Data Category is the starting point. For company related data, this would be ‘Equities’. For Analysis, this would be ‘Time Series Data’. The Series can be identified by using the Navigator function, activated by clicking on the ‘Find Series’ button. The code displayed in the Navigator search, when selected, gets copied into the search screen. For example, TSCO for Tesco PLC. The Datatype, for Share Price, searchable via the Navigator (Datatypes button) is ‘Price (Adjusted – Default)’, represented by the code: ‘P’. Time Period can be selected from set date ranges, such as ‘-10Y’, which represents the last 10 years. 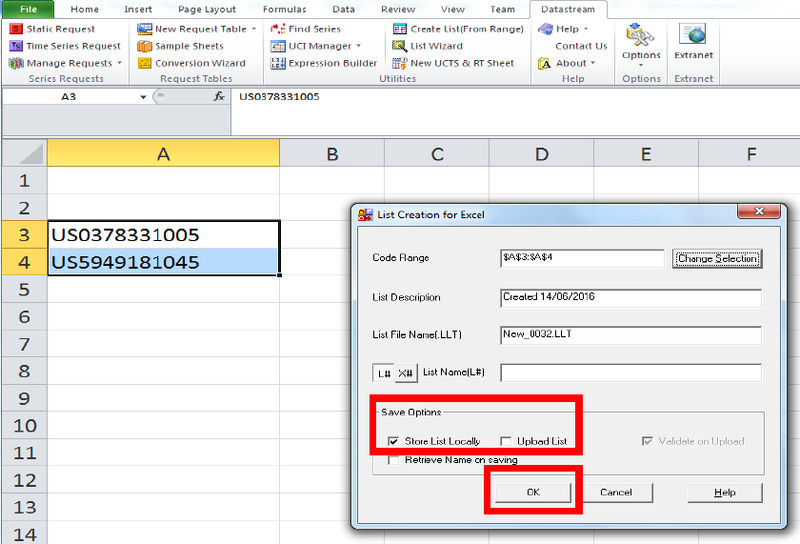 Alternatively, a specific date range can be entered by clicking on the ‘Time Period’ button, giving the option to enter a Start and End date using the format: DD/MM/YYYY. The frequency of data can be selected by clicking on the Settings button. This allows choices of ‘Daily, Weekly, Monthly, Quarterly and Yearly’, with a default of ‘Daily’. Daily is normally used for Share Price data. Finally, click on the Run Now! button to execute the search. It is then possible to add this data into a chart view, by selecting Multiple Series/Flexible Chart, then Comparison Line Chart then Rebased. By clicking on the plus [ + ] symbol, the Series is copied into the chart summary box on the left of the screen. Execute the search by clicking on the ‘Run Now!‘ button at the top right of the screen. By virtue of specifying ‘Rebased’, this represents the different series as an index, beginning at 100. 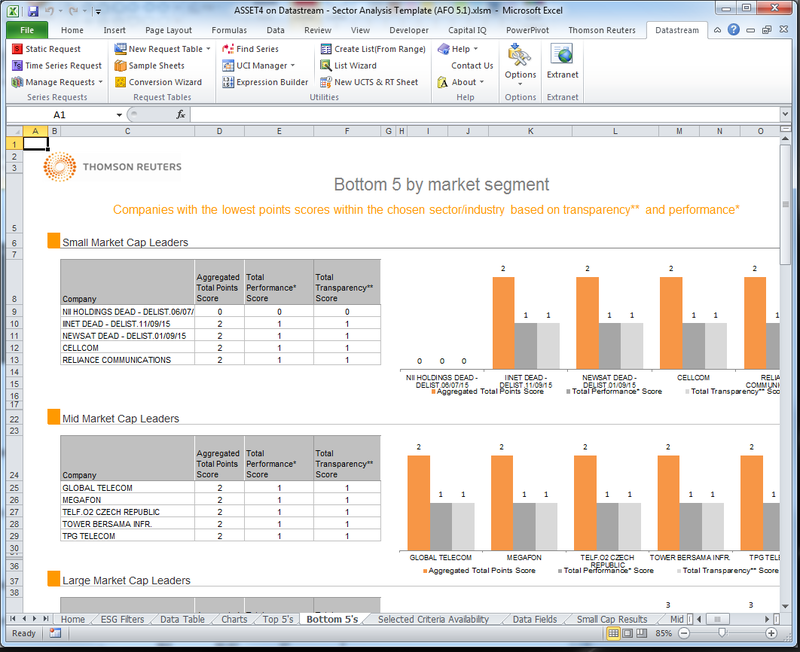 This allows a relative view of performance. Hence, a movement from 100 to 95 represents a 5 per cent decrease in the share price of a company. All three companies are showing a value of about 40 (as at 24/3/2017), indicating they have lost approximately 60 per cent of their value, as expressed by Share Price, over the last 10 years. By comparing a number of companies within a particular Price Index, it is possible to get an appreciation of how the companies have performed relative to the whole index. 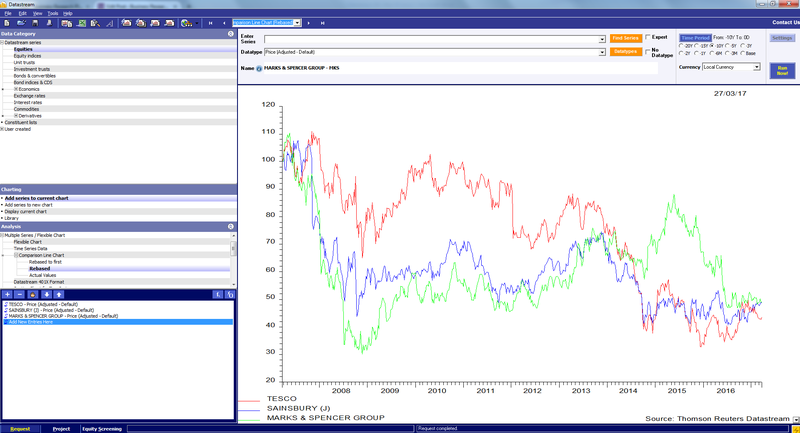 Tesco PLC, J Sainsbury PLC and Marks & Spencer Group PLC are all part of the FTSE100 Price Index. Data Category: ‘Equity Indices’, Datatype: ‘Price Index’ and run the search for data. Next, change back to the settings for Companies (Data Category: Equities, Datatype: Price (Adjusted Default), run the searches for data and add to the chart summary box [ + ]. Next, click on the ‘Run Now’ button to execute the search. Datastream: Price Index vs Companies (Line Chart Rebased to First). This chart gives a clear graphical representation of the relative performance of company Share Prices and the FTSE100 Price Index. The competition from low cost retailers such as Aldi and Lidl is a factor in the poor recent performance of Tesco PLC and J Sainsbury PLC in particular, reflected in the above chart. 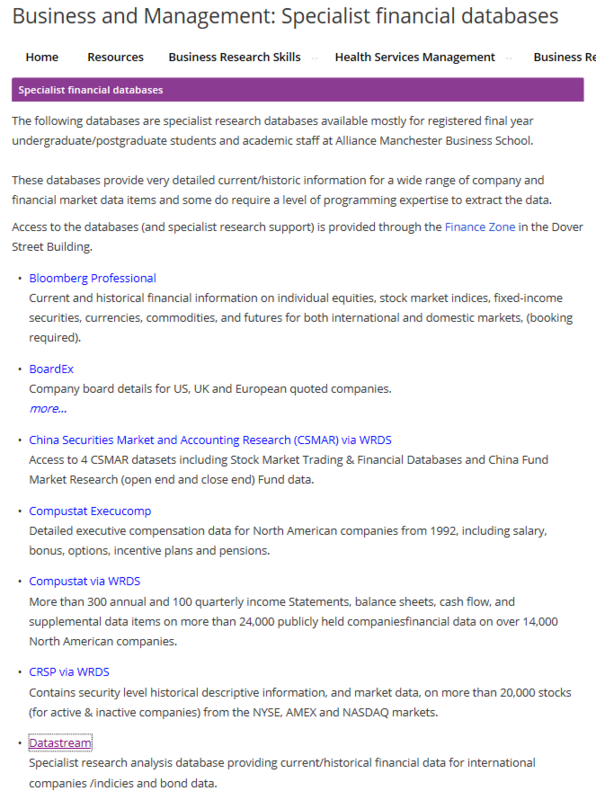 Datastream is available to current students and staff of The University of Manchester. 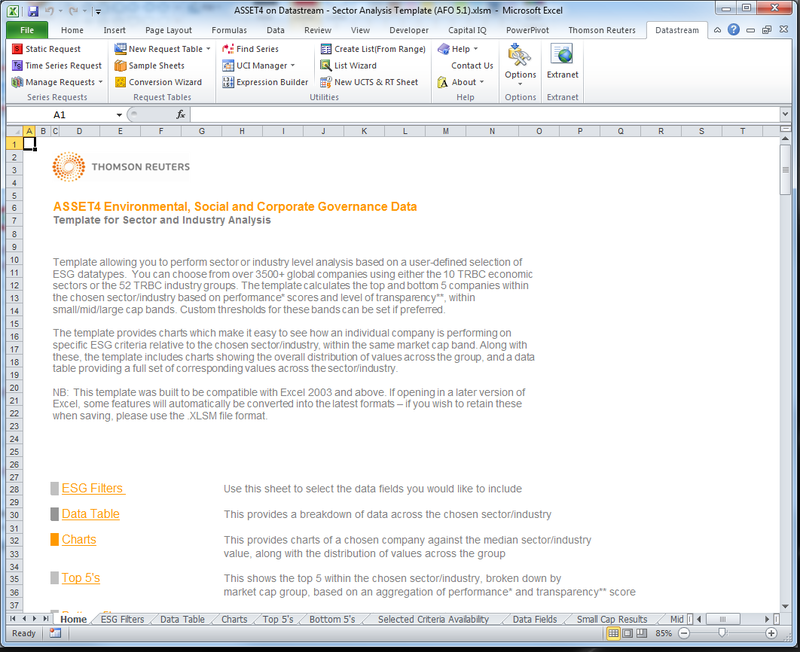 A detailed source of environmental, social and governance (ESG) data can be found in Thomson Reuters Datastream. Instead of choosing the appropriate datatypes in a regular Datastream time series request, you can download the ASSET4 template. 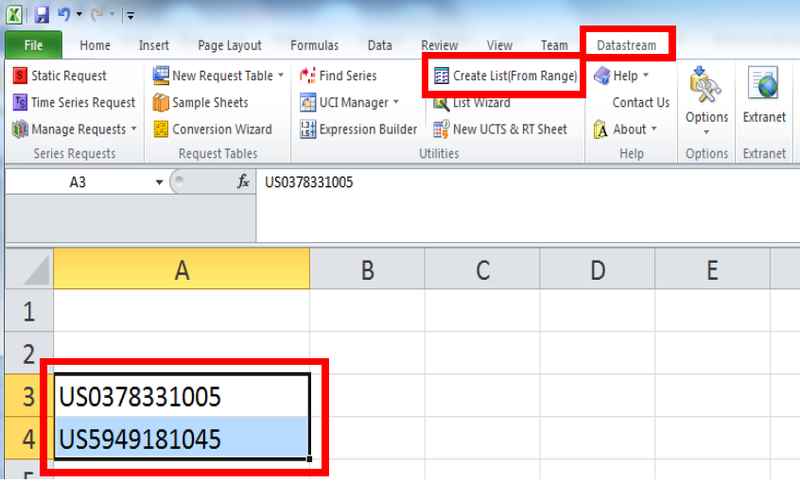 This is hard to find in the InfoBase support platform (replacement for Extranet) so I suggest you get it from the Datastream Excel add-in toolbar, although this method is not quite as easy as you would like. Open Datastream in Excel the usual way (remember the desktop icon “DSSetup – Shortcut”). 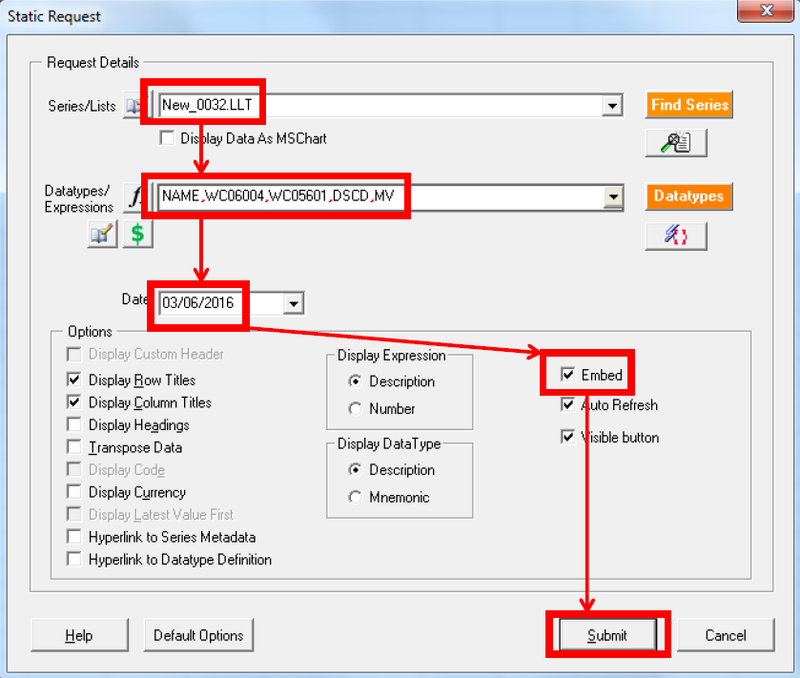 Click on the Datastream ribbon tab, go to the Request Tables group and click Sample Sheets. 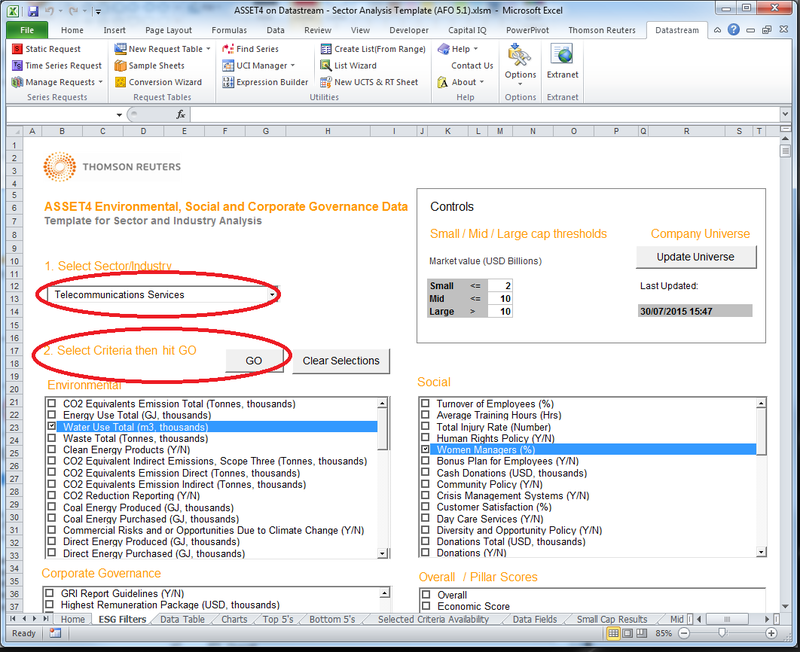 Tick the button ‘Equities : ESG ASSET4 – Sector Industry analysis’ then click the Download button. 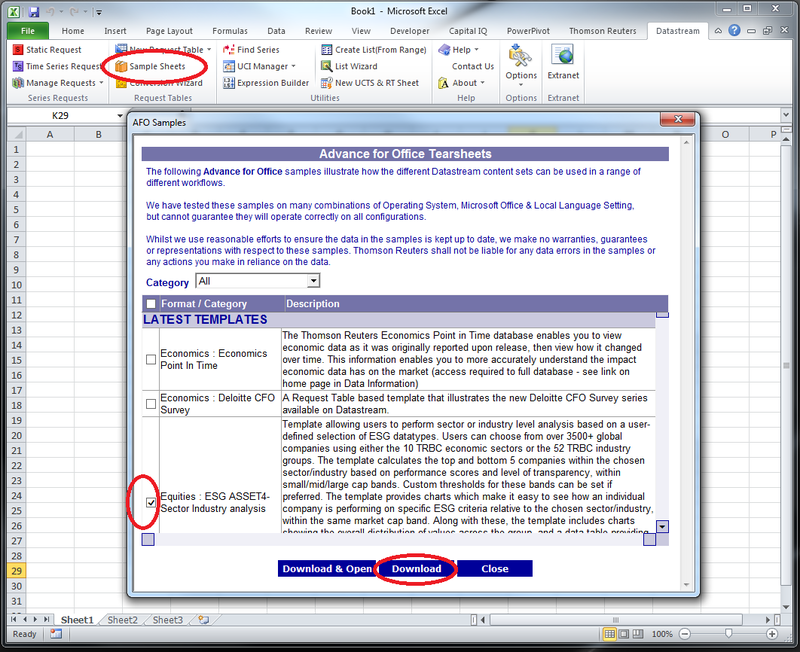 Find the ASSEST4 template with the ‘Sample Sheets’ button and download it. The Download & Open button does the same as the Download button, it doesn’t open the file. ASSET4 template downloads to a hidden folder. Note that ‘ProgramData’ is not the same as ‘Program Files’ or ‘Program Files (x86)’, it is a hidden folder. As you type the rest of the path, Windows should suggest auto-completions, which you can accept. 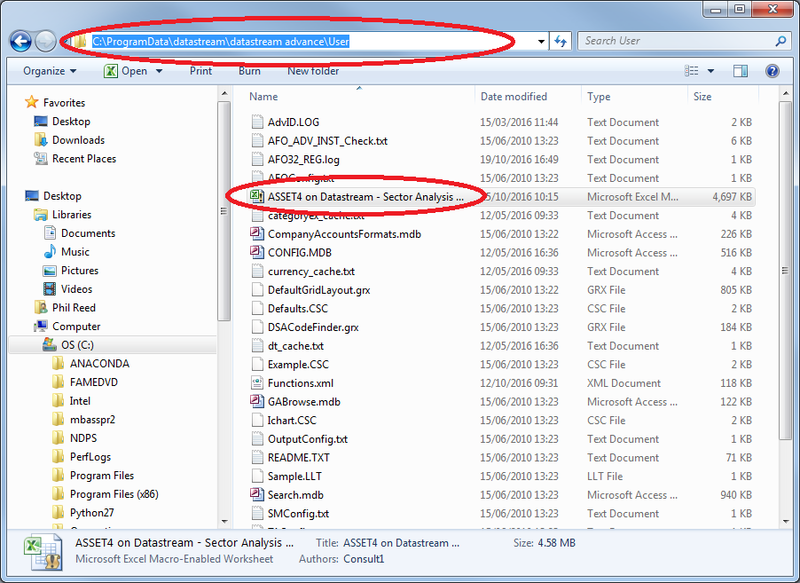 ASSET4 file location, in the hidden C:\ProgramData folder. From here, open the file and accept any warnings about enabling content. There are many sheets (tabs), starting with Home. Click on ESG Filters to select your search criteria. Choose (1) a sector or industry such as Telecommunications Services and (2) criteria across the environmental, social and corporate governance categories such as Water Use Total, Women Managers and Size of Board. When ready, click the Go button. Wait a few minutes while the data is downloaded to the Data Table sheet. The tables and charts of the many other sheets are automatically updated to reflect your search (except the Data Fields definitions sheet). For example, the Bottom 5’s sheet. If you find a datatype you would like to use in a regular time series request, make a note of its code. See also earlier post Environmental, Social and Governance (ESG) Data from July 2013. One of the most useful Excel functions I help students with is VLOOKUP – extremely useful to automatically bring in data from one table to another. If you have company accounts data from Compustat Global (via WRDS) for multiple companies in multiple currencies, you will need to bring in the change rate for each currency to show every field in US Dollars. The VLOOKUP command looks for the currency code in the first column and returns the rate from the second column (use ‘FALSE’ to ensure an exact match). The conversion is simply a multiplication. (Note that you can convert from USD to USD at a rate of 1.0.) But what about making sure that the exchange rate is correct for the date of the data, and what if you have data from multiple years? Thanks to Professor Marie Dutordoir for suggesting this kind of technique! Usually you will want to look at accounts data over several years and for several companies. If you are working with several currencies then you will need a more complicated solution to this VLOOKUP exchange rate table, considering a day/month/year for each rate-currency pair. You do not need a second lookup table or other Excel functions, you just need to have another variable of date and a variable of currency-date pairs. 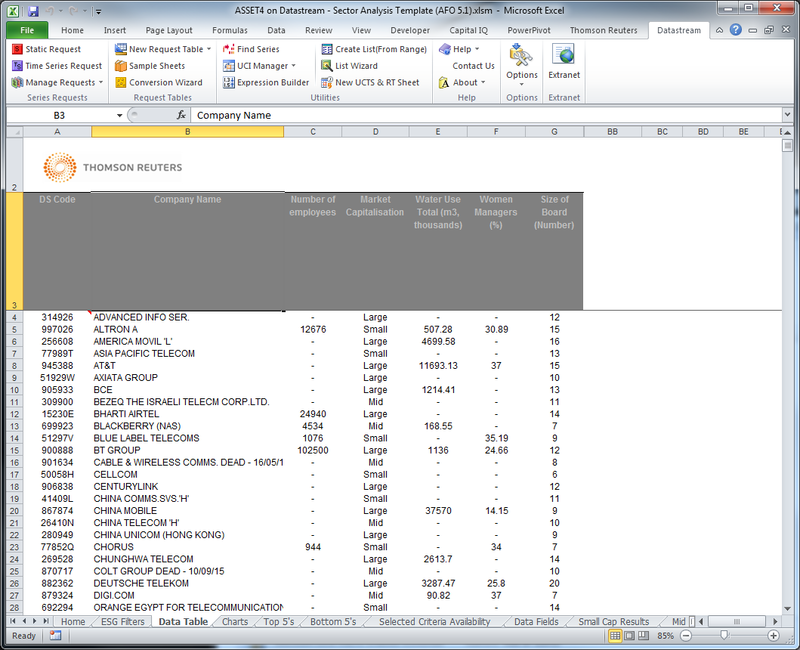 Global company accounts data. Given column G (currency) and column H (year), create new column F (map = currency&year). The new column F (mapping) is formed from currency and year, so F2 contains “=G2&H2” (see image above). The ‘currencies’ named range now begins with a different first column produced in the same way (see image below). A VLOOKUP always matches on the first column of its range, and now this one pulls the rate from the fourth column, so rate is “=VLOOKUP(F2, currencies, 4, FALSE)” for row 2. In the ‘currencies’ named range, I have combined the exchange rate calculation and lookup into one formula (column K). Repeat this for each data type that you wish to convert the currency for. Remember to have an entry for USD at rate 1 for each year. Stacked historical exchange rates in a named range ‘currencies’. Created column A (map) from B&C. This example only has the average exchange rate for each year, you may wish to extend this approach for monthly or even daily rates. If you do this, you will need to take extra care with the format of the mapping cells, but this exceeds the scope of the post. Where to find historical exchange rates? Use the Datastream Navigator to find exchange rates. Start by searching one category (Exchange Rates), limit it “To Currency: United States Dollar”, then use the search box for the source currency. Datastream (as shown in the screen above). The documentation for Compustat suggests using WRDS Cloud, but this requires knowledge of Unix and SAS, similar to the S&P 500 constituents example. Other sources of historical exchange rates (last updated July 2015).